Peter Houston admits win at Tannadice was an emotional farewell for the players who will leave Dundee United this summer. Dundee**** United manager Peter Houston explained that the end-of-season 2-1 victory over Hearts was as an emotional farewell for the players who will leave the club this summer. There was little more than pride to play for with Hearts and United already confirmed in third and fourth places respectively in the SPL. David Goodwillie's opener was cancelled out by Gary Glen before United skipper Jon Daly fired home the winner with a low drive after twenty minutes before the end. Morgaro Gomis, Prince Buaben, Craig Conway and second-half substitute David Robertson all featured for the Tangerines in what looks likely to be their last game at Tannadice before they move on to pastures new in the summer. The quartet, who were all part of the United side that lifted the Scottish Cup and finished third in the SPL last term, were given a warm send-off by the home support. Houston said: "The boys were quite emotional as they have really enjoyed their time at Dundee United and we have really enjoyed them being here. "They can walk out with their heads held high because they were part of the team that won the Scottish Cup." Houston was delighted to end the season with the win, which meant his side finished only two points behind the Tynecastle club. The Dundee United manager added: "It is a good way for the guys to sign off. I thought it was a pretty even game and, truth be told, a draw would have been a fair result but we will take the victory. "It means we finish on 61 points, which is only two points short of what we managed last season. It is a great credit to the players and we wish the players who are moving on from the football club good luck as they have done this club a turn." Hearts manager Jim Jefferies gave youth a chance by making six changes from the team that lost 3-0 to Celtic midweek and, despite the defeat, said he was pleased with the way his team performed. The result meant Hearts finished their SPL campaign without a win in their final eight matches but managed to hold on to third place despite a late charge from Dundee United. He said: "I had a laugh with Peter Houston before the game as he said he might play a few young boys but in the end he put out possibly his strongest team. "We said we would give some of the boys who have had to wait on the bench a chance. We had a lot of players out today but the boys that came in did us proud. 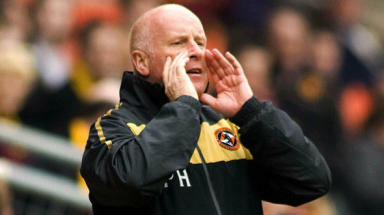 "I had five of the under-19s who have had a fantastic season on the bench today. Hopefully the ones that came on will remember the day and use this as a positive to want more experiences like this. "With the way the game flowed from end to end I thought a draw would have been the right result but it wasn't to be."